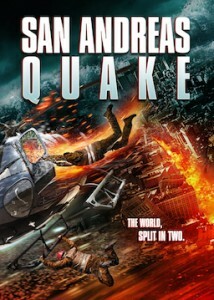 San Andreas Quake has all the action, effects, and characters to make this film a pleasure to watch. The movie stars Jhey Castles, Blaire Chandler, Grace Van Dien, Jason Woods, and Alex Diehl. Director and writer John Baumgartner had the mockbuster filming challenges and he rose to the occasion and provided non-stop, entertaining, intense ride from start to finish. Asylum veteran cinematographer and DP Ben Demaree worked alongside Baumgartner on the film. “For San Andreas Quake the biggest thing that stood out was that I had worked with all the main cast before. I had shot Sleeping Beauty with Grace Van Dien in Bulgaria, Age of Tomorrow with Lane Townsend (get him an axe! ), and then this was my 3rd time working with Jhey Castles as she was in both of the films I’ve directed, Hansel vs Gretel and Apocalypse Pompeii. So it was like a family reunion on set for me and made the tough schedule and numerous logistical challenges a lot more bearable. We had fun,” shared Demaree. In the opening minutes, the premise is clear and the stakes are high. We meet a teen, Molly, who is passionate about studying earthquakes and experiences a tragic one while in the back yard with her father. Fast forwarding 20 years, the past experience propelled her into designing a program/model that can accurately predict earthquakes along with their magnitudes. Molly (Jhey Castles) now is a professor at the local university and has a husband (Lane Townsend) and is a step mother to Ali (Grace Van Dien) who has the typical resentment to her stepmother. Molly’s program that she has worked on and perfected for years is finally operating and able to predict earthquakes. However, the model cannot predict with exact precision, which keeps the tension high not knowing exactly when the quakes will occur. A swarm of micro quakes show up on her model which is in indication that the big one is inevitable very soon. Molly has to save her family and warn the region. That is a huge challenge for her as she was wrong on a prediction back in 2008 that caused major panic. The authorities didn’t forget that incident and don’t trust her current prediction. Molly needs Ali’s boyfriend Nick’s (Jason Woods) car to travel from the university to Ali’s downtown Los Angeles hotel where she works. Nick happens to be one of Molly’s students, who is not one of her favorite students, to say the least. Their journey avoiding disasters and obstacles builds their relationship and trust. What’s a better way to solidify a relationship than battling through hostile gun bearing stranded mothers, natural gas leaks and explosions, tight tunnels to crawl through emitting lethal fumes, and a pissed off momma hippo?! It took multiple micro quakes for the authorities to finally believe Molly and they order a mass evacuation resulting in gridlock throughout the region. The military has orders to arrest and stop anyone with whatever force necessary from entering the downtown area, which adds more difficulty for Molly to reach her daughter. All this excitement and action with the micro quakes is just a sample of the effects before the big one. So, where is the father/husband in all this? He’s doing the best he can to get his tour helicopter to the hotel to save his family. Due to circumstances beyond his control, he has to save the baby of a couple love birds he was up in the air giving a tour while the quakes were occurring in the beginning. When you meet the baby at the end you’ll realize it was worth the risk. San Andreas Quake is a thrill ride and Baumgartner does a fantastic job keeping the audience entertained, at the edge of their seats, snickering with subtle sarcastic comments, and cheering on all the characters to survive. A film of this level requires time and budget which was not available for Baumgartner. He shares the entire experience he endured making San Andreas Quake. It’s a big challenge making a film for the Asylum, as their budgets and schedules are incredibly restrictive and small. That includes the time to write. In this case, I had about 4 weeks to write the script (along with a little help from some ghostwriting buddies), which actually overlapped with the prepping of production. (Which sometimes meant you were prepping scenes that weren’t yet approved or in some cases even yet written!) The main intention of the script was to create characters that had a lot of organic, interpersonal conflict, to help propel the story. With a very limited budget and schedule, you have to very wisely pick your battles, where you’ll spend your resources. Having characters with believable conflicts not only would help ground the story, but would help the budget and schedule. This explains why Molly and Nick find themselves having their arguments in the car over and over again, for better or for worse. Thankfully it was organic to the story, if perhaps lacking cinematically. A worthy compromise because it meant we could spend more time on the action sequences. There were a couple sequences which I made sure to give as much shooting time to as possible. (And again, we’re talking LITERALLY 10X less time than the big-budget version would enjoy). Those sequence included the car jacking scene (I love the actress Blaire Chandler and felt she could deliver a special performance, and the scene could stand dramatically on its own without VFX or pyrotechnics.) Also, the finale scene where Nick goes flying out the window was the sequence I tried to hardest to protect for shooting time. If you watch it closely, the number of stunts, cuts, and shots is well above what is usually allowed on these budgets, so if there’s any sense of cinematic action and danger, it’s because we sacrificed in other places so that scene could have the time. I owe a big debt of gratitude to my stunt coordinator Kyro Waveborne, who pulled a lot of favors and was always pushing me to do bigger and better, beyond what the budget would allow, all while making safety the absolute priority, another rare thing on budgets and schedules of this size. Kyro always had great ideas on set that were truly dynamic and cinematic but often we simply didn’t have the time, and I know that was frustrating. But I think he still pulled off some amazing feats, whether it be the stunt driving, the stunt falls, or how he trained our actors to do their own stunts when conditions allowed. Working with the cast was a blast, not a bad apple in the bunch. Jhey Castles and Jason Woods, with whom I worked the most, were up for anything, grateful to be there, and very fun. They never lost their cool, always had a smile and a joke, and that’s a great energy to have around as the crew and I were losing our minds to the stress sometimes. Ben Demaree, our DP, is unflappable and a really gifted artist, and although it took a few days for us to adjust to each others’ rhythms, we got our stride and I knew I could trust him for some beautiful lighting and operation that well exceeded the resources and budget he had to work with. You could set your watch by his lighting time estimates and nine times out of ten you couldn’t believe he threw together what he did in the time allotted. Plus he and Jhey had a fun history together on two other Asylum films (Apocalypse Pompeii and Hansel vs. Gretel), so it was a happy reunion for them. The movie was limited to 100 visual effects shots, which is pretty restrictive for a disaster movie (as comparison, my last VFX project, MIDNIGHT SUN, was a 4 minute film with 42 VFX shots – viewable at JohnBaumgartner.com ). I had to be very disciplined about this. In prep, I drew up spread sheets accounting for every VFX shot, based on my storyboards and diagrams, and I had to stick to it religiously. Joe Lawson and his VFX team at The Asylum had a very, very full pipeline with a number of films being worked on ahead and after mine, none-the-least being SHARKNADO 3. So it meant going over the limit would not be tolerated, as well as the fact that they would only have little more than 3 weeks to complete the shots for the entire movie. Joe Lawson, the VFX supervisor, is wonderfully fun and really cares, so in addition to being a fantastic and generous guide, he delivered the very best that the time and budget allowed, and sometimes, miraculously, beyond those limits. But, there is only so much time, and some shots are what they are and that’s perhaps the charm of an Asylum movie. But some of the shots, the ones we earmarked as important from the beginning, got the loving they deserved, and hold up exceptionally very well, I feel. A huge thank you to John for all the amazing insights into making San Andreas Quake. The film is now available on DVD, so be sure to check it out!